Hockey Stick Illusion: “Shut-eyed Denial” | Watts Up With That? A shout-out for a review of Andrew Montford’s “The Hockey Stick Illusion” by Matt Ridley in Prospect Magazine. Andrew Montford’s The Hockey Stick Illusion is one of the best science books in years. It exposes in delicious detail, datum by datum, how a great scientific mistake of immense political weight was perpetrated, defended and camouflaged by a scientific establishment that should now be red with shame. It is a book about principal components, data mining and confidence intervals—subjects that have never before been made thrilling. It is the biography of a graph. I can remember when I first paid attention to the “hockey stick” graph at a conference in Cambridge. The temperature line trundled along with little change for centuries, then shot through the roof in the 20th century, like the blade of an ice-hockey stick. I had become somewhat of a sceptic about the science of climate change, but here was emphatic proof that the world was much warmer today; and warming much faster than at any time in a thousand years. I resolved to shed my doubts. I assumed that since it had been published in Nature—the Canterbury Cathedral of scientific literature—it was true. I was not the only one who was impressed. The graph appeared six times in the Intergovernmental Panel on Climate Change (IPCC)’s third report in 2001. It was on display as a backdrop at the press conference to launch that report. James Lovelock pinned it to his wall. Al Gore used it in his film (though describing it as something else and with the Y axis upside down). Its author shot to scientific stardom. “It is hard to overestimate how influential this study has been,” said the BBC. The hockey stick is to global warming what St Paul was to Christianity. The rest of the review is here. Well, it happens. People make mistakes in science. Corrections get made. That’s how it works, is it not? Few papers get such scrutiny as this had. But that is an even more worrying thought: how much dodgy science is being published without the benefit of an audit by Mcintyre’s ilk? As a long-time champion of science, I find the reaction of the scientific establishment more shocking than anything. The reaction was not even a shrug: it was shut-eyed denial. March 14, 2010 in Book Review. I am currently reading this book. It is a brilliant account of the Hockey Stick story. It should by now be evident to both alarmists and sceptics that this entire business has never been truly a “scientific” determination. So either our respective governments know something too sensitive for public knowledge (unwashed masses) or they are all complicit in a massive global economic restructuring programme. Either way I take strong offence to their determination that I am too ignorant to be advised accordingly. Further I feel that their underhanded and scam –like attempts to frighten populations into irrational mindsets is treasonable to the populations they are entrusted to serve. It is a travesty of justice that these “leaders” are not held personally responsible. A simple test for anybody would be to answer truthfully whether anyone of us would place the live of one of our children in the hands of a surgeon, knowing full well that the proposed procedure is based on “science” as unpredictable, suspect and unknown as climate science. I think not. Bought it already, to be read, shared if I can find some willing readers (or perhaps unwilling students in a captive audience), and then proudly shelved beside Mosher and Fuller’s engrossing and wonderful “Climategate: The Crutape Letters”. I’m glad that someone who has been following this from the beginning has documented McIntyre’s brave and persistent contest against the global warming oligopoly. Both Bishop Hill and McIntyre are true Davids. Sounds like a good read. Unfortunately, unless it can be Twittersized, very few of the general public ( the electorate ) will ever hear about it, much less take the time to read it. And forget about them understanding one word of it. I doubt it will ever be included in any school curriculum or show up on a best seller list dominated by Romance novels. Might get some traction if it were programmed as a first person shooter video game. Extended, intransigent, and unbending denial; even in the face of (and long after) the obviously substantive and reputable work done by McIntyre and McKitrick. Major red flags were raised about MM’s hockey stick fantasy for all to see over FIVE YEARS ago. What additional mistakes, exaggerations, and flat-out frauds that would properly fit under the ClimateGate umbrella have even now NOT been turned up yet, but still need to be ?? I just ordered it. If it lives up to my expectations I will probably buy a “loaner copy” to share with others. I saw a good idea on another thread, get your local Library(s) to order a copy, someone might just read it there. I have an acquaintance who is profiting – massively – from the climate scare . . . if only . . . if only I could get this book to him anonymously. His wife and I are friends and I don’t want to make waves. A year ago when I queried him (a scientist) about his level of certitude regarding AGW – he pegged his confidence it at 120 %. He was on board with that hockey stick – big time. I love the term “shut-eyed denial.” It certainly describes the reaction of the scientific community. Too much money is at stake. The subject I would like to see explored more is how climate science became so anti-science. I think it started with Mann refusing McIntyre data. Mann supplied some data at first, but when McIntyre showed he understood what was going on and the data he had only raised more questions, Mann stopped cooperating. This was a frontal attack on the openness and transparency of science. Phil Jones refused data to Warwick Hughes saying he had 25 years invested in the data and he wouldn’t provide it to someone who just wanted to find something wrong with it. Science is supposed to be self-correcting but it cannot be if people refuse to provide data. Here are my questions: Who refused to supply data first? Was it Mann or Jones? How did they know they should refuse to supply the data? Did they already know their science was screwed up? Mann knew his reconstruction failed one verification statistic but failed to report that. What errors did Jones know about regarding the surface temp record? What, no Amazon Associate link so we can send a few cents to WUWT when we buy it? I assumed that since it had been published in Nature—the Canterbury Cathedral of scientific literature—it was true. I’ll be getting it for my birthday next month, and I can hardly wait. This to me sounds like the book scientists ought to be reading if they want a case study on how not to do science. I also plan to buy a couple of copies to give out as graduation presents. James Lovelock pinned it to his wall. Al Gore used it in his film (though describing it as something else and with the Y axis upside down). Its author shot to scientific stardom. “It is hard to overestimate how influential this study has been,” said the BBC. The hockey stick is to global warming what St Paul was to Christianity. ….the benefit of an audit by Mcintyre’s ilk? Paging James Hansen…..paging James Hansen……James Hansen, come to the front desk please. Buy it today, I’ve just read it and can say that it’s as exciting as any Richard Hannay (remember “The 39 Steps”?) adventure, fantastic and a homage to the McNemesis’ who unmasked this piece of scientific skulduggery. People have been doing that for millennia. McIntyre quickly found errors: mislocated series, infilled gaps, truncated records, old data extrapolated forwards where new was available, and so on. These are ‘standard practice’ that is ‘widely accepted in the climate community’. Why is this blog being so ‘unfair’? Hey, hey, watch it there! That is ‘standard practice’! You’re making it look like something funny is going on! That’s it! I’m running strait to Monboit, Connolley, and David Roberts at Grist. They’ll listen me! The reviewer Matt Ridley has written several superb poplar science books, like Genome: The Autobiography of a Species in 23 Chapters, and Nature via Nurture: Genes, Experience, & What Makes Us Human. This is a powerful review by someone who is a highly respected award winning author and very science-minded. Let’s not forget that the origins of this phenomenon are financial and political plans by Maurice Strong and the Club of Rome who made it public years ago that they needed a crisis around which to cause the birth of a new world order and power structure. This, indeed, has never been about the science of climate. This whole exercise has been a fight to have the “climate science” project recognized as part of this long-term political/wealth/power takeover plan designed to reduce the world’s population, cripple development of the undeveloped countries, and de-industrialize the developed countries. Kumbayah and log cabins all around while we go 100% agricultural, Luddite, and nontechnological. Skip that retirement fund, life expectancy will be too short to bother as medical care will be only at the midwife level. Oh, and horses emit too much methane so one of you will have to pull the plow today, mush! ……the principal component analysis “mined” the data for anything with a 20th century uptick….. This is what you’re supposed to do when you have an issue as important as this. Just ask Steven Schneider and Al Gore! It’s not lying when you have an important cause. And look, Al Gore won the Nobel. Steven Schneider was on stage with Al Gore when he accepted the Nobel! How can the Nobel people be wrong? You see the Hockey Stick graph right there in plain view as soon as you open his page? Steven Schneider teaches at Stanford. How dare you have the nerve to question him! About this supposed, and now disgraced hockey stick. If CO2 did have a physical property to absorb and hold heat longer and in greater amount than other consituent parts of the atmosphere, O2 (20%) & N2 (79%), and H2O (1% as water vapor), then per the laws of physics carbon dioxide would rise in the atmosphere relative to those other consituents. And wouldn’t it build-up like O3 (ozone) in a layer high in the atmosphere? But no such layer or build-up of carbon dioxide has been detected. This lack of measurable build-up suggests carbon dioxide doesn’t behave appreciably different than oxygen or nitrogen (which dominate the atmosphere) in terms of energy absorbtion & release. Therefore, increases in carbon dioxide’s percentage in the atmosphere would have no impact on climate changes. In any event, if there was an effect of CO2 rising-up towards the atmosphere’s contact with space, the suface of the atmosphere, if you will, where a larger amount of heat was then released (supposedly because CO2 holds more heat longer), this heat would be exhausted out into space and not contribute to the Earth’s heat budget. Wouldn’t this act as a kind of heat pump causing a cooling effect? Is this why you never hear or read AGW scientists analyzing the physical mechanics of rising CO2 in terms of the ideal gas laws? Obviously, they can’t because they’ve put all their chips down on some supposed mechanism that works the exact opposite way. In defiance of the known and accepted laws of of physics & chemistry. In view of this set of physical relationships (ideal gas laws) it is encumbent on AGW scientists to explain how & why their supposed mechanism has any physical basis in reality. To my knowledge (and correct me if I’m wrong), AGW scientists have not demonstrated how their mechanism fits within these known physical constraints & parameters. AGW proponents, please explain why the above discussion is wrong, or/and devil’s advocates for that’s matter, because we need to get to the bottom of the science. These are the kind of things AGW scientists have to answer before serious consideration is given to their claims. Interesting to see a good review in Prospect magazine – it’s a left-of-centre lifestyle magazine. I ordered a few copies last week. I’m going to donate some to the Calgary Public Library to go along with the copies of “The Crutape Letters” I donated earlier. The most frustrating thing about the hockey stick debate is the desperate tactics used by its supporters to resurrect it. 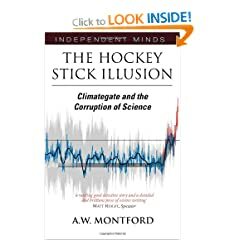 They constantly produce a new study confirming the hockey stick knowing that it will take time for McIntyre to expose it as a cherry picking piece of research supported by dubious statistical techniques. By then they’ve produced another ‘improved’ study. That way they can always claim that the latest piece of research supports the hockey stick. down the curtain and joined the bleedin’ choir invisibile!! THIS IS AN EX-HOCKEY STICK!! It’ll live up to expectations. I’ve read it twice. For some great background on the whole ‘green’ crisis industry, Elaine Dewar’s book ‘Cloak of Green’ is also worth a read. Little out of date but provides the context for the AGW project and its related eco-scares. This has always been about Truth versus deceit. What amazes me is that the deceitful have been so able to perpetuate their dishonesty. I am beyond thinking any more that we are dealing with honest mistakes. This is a good, old-fashioned battle between good and evil. So is everyone out here up in arms about the use of the d-word? I’ve never been bothered much by the terms ‘denier’ or ‘denialist’, Bart, because they pale in comparison to much of what I’ve been called on the alarmist boards. Nonetheless, it is often used with much the same tone as ‘Holocaust Denier’ is. And that offends some people very much. It’s the tone as much as the term. Truly, I do deny the IPCC’s conception of the effect of CO2, considering, as I do, the effect to be much exaggerated. That’s how I justify the term ‘alarmist’ to describe those who still seek to fearmonger the populace. The time is rapidly approaching, though, to stop forming tribes to throw rocks at each other. We need to find out the true sensitivity of climate to CO2 and this chasing of the chimera of CO2 demonization has wasted a lot of time. Ah, Bart, I read your comment again and I see the nasty sort of disingenuousness I see commonly from you. The verb ‘to deny’ is still a useful English word, and Ridley has so used it. It is the alarmist faction in climate science that sought to illegitimately give their theory of AGW the certainty of the historical Holocaust, and to cast the skeptics into disrepute, who have misused the term. So take your silly little insinuation and cast it into your museum of precious disingenosties. Need a little more shelf space? er, ‘precious disingenosities’. That’s a rock with sharp points on it, Bart. OK, I’m skeptical of all the claims too. I’ve used non-linear models in making my living for going on two decades, so I am really skeptical about the claims there. So, even though I have seen charts that do not agree with these charts, and common sense would suggest that we were at least as warm one thousand years ago, what is the response to this post? Maurice Strong is now in China advising the Chinese government. Unless that’s how they describe house arrest. I didn’t know Canada had a Marxist in such a position like America has now. Critique of Hockey Stick a Partisan Set-up? Was the independent report on the Hockey Stick climate reconstruct that Dr. Edward Wegman prepared in 2006 for the U.S. Congressional Committee on Energy and Commerce actually a partisan set-up? According to a recent article at climateprogress.org, ‘Wegman, who had presented himself as an impartial “referee” between two “teams” debating the quality of the so-called Hockey Stick graph was, in fact, coached throughout his review by Republican staffer Peter Spencer. The article also alleges Wegman and his colleagues worked closely with one of the teams, especially Hockey Stick critic Stephen McIntyre, but not with the authors of the climate reconstruction (Michael Mann, Raymond Bradley, and Malcolm Hughes). The report was requested by Republican Rep. and Energy and Commerce Committee Chair Joe Barton, who refused an offer by the National Academy of Sciences to do an independent study, and opted for Wegman instead. I finished reading it the other day. The positive reviews are well deserved. It read like a thriller, I found it hard to put down and my thoughts returned to it throughout the day. I suggest criminal neglect is a more appropriate term. Please provide the proof for your claim. Why is it important whether something was a set up? We are not in a drug scene sting investigation. Dodged statistics by Mann are dodged statistics. They will still be dodged in a 1,000 years whether a Steve McIntyre explores it or not. How does your common sense tell you that we are “at least as warm [as] one thousand years ago” when Vikings have settled in Greenland, doing agriculture, in the MWP? “A 2000-YEAR GLOBAL TEMPERATURE RECONSTRUCTION BASED ON NON-TREERING PROXIES”, Craig Loehle, Ph.D.
My dear Wren, please take my advice. You really risk damaging your psyche by participating in the paranoia of Joe Romm and Deep Climate. As Dirk points out above the Piltdown Mann’s Crook’t Hockey Stick is phony from the inappropriate use of decentered Principal Component Analysis. Ask Ian Jolliffe. What is shocking is that it took a Congressional investigation to challenge it, and even when world expert statistician’s panned the use of decentered PCA, still many in climate science defended it, as some still hopelessly do. Another interesting point from the Wegman report was delineating the echo chamber in climate science peer review, a point which has been double-underlined in spades by the revelations in the released emails. So please, ignore those sick defenders of the faith to which you’ve been listening. The truth shall set you free. You spin it in a misleading way, as is usual for those who wish to use the Hockey Stick as proof of manmade global warming. You make it appear they they are saying it is warmer now than it ever has been in the last 2000 years. You make it appear that they approve of the Hockey Stick. BUT THEY DO NOT. Science by its nature requires unforgiving accuracy. Fudging, and gray areas, do not have a place in science. Is this a joke? Or a serious assertion that a temperature trend of two and a half months is evidence of a permanent shift in climate? I was puzzled by this remark… now it occurs to me that what Will S. refers to must be the fact that Dr. Spencer switched to a different moving average! Dr. Spencer explained why he did so. Will, is that a problem for you? “Readjusted the formula”… oh come on as if we’re talking magical potions here! You can run your own moving averages on his data, you do know that, do you? Are the CO2 proponents now all reduced to the nitpicking shambles that pop up here regularly? Where’s the intellectual calibre? It is evident that it will take more than one book to debunk all of the IPCC’s mantras on climate change. The IPCC and their adherents are indeed deliberately shut-eyed to their own dilemma. John Houghton has defended the IPCC against charges of ‘ecofanaticism’ in this recent Times article. One claim in the Times article runs “The IPCC process also makes it impossible for green propaganda to be slipped in.. (to the reports)”. I thought that several references in the IPCC reports were shown to be from Greenpeace and WWF sources? I think you read my sentence wrong. I said that it looks like we WERE at least as warm during the MWP. I was just curious why that one post was not challenged. Let me cheer you on in bringing the Hockey Stick and all of global warming science into a Senate Investigation. I want to see it televised on C–SPAN. I want to see all of the evidence from both sides broadcast for the world to see. Try to find that felony! It would be wonderful to see Christy, Spencer, Lindzen, Monckton, Ferenc Miskolczi, Happer, etc, answering questions on the real science. Ken is quite correct here. I am a retired biochemistry professor. Some scandals in biomedical research started being publicized about 10 years or so before I retired. The NIH made schools forms committees to investigate the allegations of fraud in research and these are still present in the the universities. Several prominent researchers were barred from federal grants for many years and some were, I think, prosecuted. In my opinion, these fraudsters should be drummed out of the scientific/academic establishment and several should be prosecuted for fraudulent misappropriation of federal funds, not to speak of the havoc they have played with our economy. I’ve seen it before. Nothing new. Method is more important than results? James Hansen, a no air conditioning partisan set up? Mann received a half million of stimulus money. As it is public money, I would like to know how every penny is spent. For some “public relations” is just another word for propaganda. I am increasingly convinced the entire hockey stick farce was a public relations gimmick from the start. It was done with the same cynical disregard for Truth as is seen in commercials for Chocolate Sugar Bombs Cereal, aimed at little children watching Saturday morning cartoons. Forgive me, but any time I see inane comments such as those by “Wren,” I can’t help but wonder if some of Mann’s “stimulus money” was used to hire useful idiots. Once I was an aspiring young writer who loathed working a real job, and consequently had trouble coming up with the rent. My situation was so desperate at times that I probably would have used my gifts to sell Chocolate Sugar Bombs Cereal, had I the chance. I don’t claim I am beyond corruption, but simply state no one felt I was worthy of being corrupted. Years ago, I felt this was unfortunate, but now I understand I was actually blessed. Fellows like Mann, and especially Briffa, were not so lucky. Briffa makes me especially sad, for initially I believe he really did think he had discovered something no one had seen before. By the time he realized all the acclaim, fame, and funding he was receiving was nothing but a public relations gimmick, he was in up to his neck. However things have simply gone way, way too far. We are not talking about selling a few packages of Chocolate Sugar Bombs cereal with a little “white” lie. We are talking about economic disaster, about a Great Nation like England brought to its knees because it is building windmills that won’t work in a cold wave, and also about much, much worse. Consequently I think we should demand Mann account for every penny of the stimulus money he has received. Not a penny should be spent on Madison Avenue hype. Every penny should go to Truth. Truth will show the hockey stick was hype. WHERE IS MY KINDLE VERSION?! Well, Wren, i don’t know how to bring it to you, but if you botch up your statistics, the result probably won’t be right. Other researchers will not be able to understand how you created that graph you published, you see? Even if you are open about the assumptions your method makes, these assumptions might be on flakey ground. Even worse, some researchers seem to have a hard time understanding that often, mathematical algorithms make implicit assumptions about trends or other properties of the data. If you use a tool that you don’t understand or don’t care to understand, you might mistake the artefacts of the method for a real signal. That’s why the choice of the method is important and needs to be done with a lot of care. Usually a researcher will want to avoid a false positive. You say: ‘Method is more important than results’? How’s this: ‘Right result plus wrong method equals bad science’. You’d know that if you did a little reading. Besides, the Piltdown Mann’s crooked stick was a wrong result and a wrong method. That’s double plus ungood science. Another thing, Wren, you’ve clearly overdosed on the RealClimate Kool-Aid to think that the Hockey Stick has been confirmed by subsequent studies. Look carefully, and you’ll see the non-uniformitarian split bark bristlecones, the twisted Gaspe series, the Yamal Enchanted Orchard, and the dizzy lake varves in study after study purporting to confirm the hockey stick. They are inadequate series and time and again they can be shown to warp the whole study. Get it through your head; the hockey stick is propaganda. Good stuff, too; it worked on you. But it is The Big Lie, repeated over and over and over again. Worst of all, it’s been used to indoctrinate youth. This is very bad, and so are you, Wren, unless you are just a useful idiot. University of Washington presented the broader findings of a NRC panel that acknowledged the statistical issues raised by Wegman, but defended the hockey stick based on a broader scientific context. Method Correct + Answer Wrong = ? Sure, but if I am so intent on nit-picking I miss the forrest for the trees, that ain’t good. McIntyre didn’t show Mann’s Hockey Stick is wrong, nor did Wegman. Read the report in the ASA newsletter I described previously. Looks like Wegman is saying OK Mann may have the right answer, but I don’t like the way he got it. ……This subject has been thoroughly vetted several years ago by the National Research Council, which found that Mann’s statistical approach was suboptimal, but his overall conclusion was justified;……..
Good question. The response is actually another question. If this unprecedented warming had a precedent 1000 years ago, when CO2 and mans burning of fossil fuels was not to blame, then how does the warming in the late 20th century prove the AGW hypothesis? Answer. It doesn’t, hence Manns statistical efforts to send the MWP down the memory hole. It is also interesting BTW that there is a credible hypothesis that the de-forestation in Europe for crops that preceded the LIA caused the LIA, or played a part in it, as it changed the surface albedo and caused more short wave radiation to be reflected, and so cooled the land (the LIA did not end until 1850 and improvements in agriculture reduce the rate of deforestation) . It is very possible that some of the warming in the late 20th century, if not most, in the Northern Hemisphere may be due to reforestation of the last 60 years (made possible by improving crop efficiencies, government ownership of public land, and reduced rates of population growth in the developed world), combined with increasing population (in the devloping and undeveloped world) and energy consumption (everywhere, as energy consumed to do work or heat gives off heat), as well as urban sprawl. 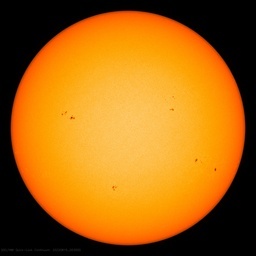 Not to mention a more active sun. There is also the change in ocean circulation (PDO) in the Pacific that began in the 1970’s. The argument is not are we warming, as nobody argues that we have not warmed over the past century (the not warming argument is limited to the last 10 years). The question is if mans emissions of CO2 is the cause, and if not, what is, and what kind of warming (or cooling) can we expect in the future. To say this science is settled in the midst of so much uncertainty is downright Orwellian. Even my dog raises his ears and looks puzzled when I tell him the science is settled, but maybe thats because I start giggling uncontrollably. Mann is so lucky. He misused a statistical method and got the answer right anyway. Give it up. You loose all credibility with your defense of the debunked, Mann Hockey stick. Your link is broken just like the stick. You misrepresented what the NAS said about the hockey stick. I don’t have reason to trust you. How about if you read McIntyre’s blog about it. And read the book that this post is about. You may need to read the NAS report more closely also. Was the James Hansen no-air-conditioning-on-the-hottest-day-of-the-summer testimony a partisan set up? MBH apologists like Wren have been trying to debunk Prof Wegman’s methods, without success, ever since Wegman made his seminal report to Congress. This is yet another failed attempt to falsify Wegman. That is how the scientific method works: what is left standing after repeated attempts at falsification is accepted as science. Wrong. It is good science. Refusing to accept the conclusions that result from the proper application of Prof Wegman’s statistical methodology is bad science. In other words, Prof Wegman’s statistical methods were correct. But the conclusions that flowed from Wegman’s methods were not what some folks wanted to hear. Michael Mann’s Hokey Stick chart has been debunked seven ways from Sunday. It is pseudo-science; science fiction. And like it or not, Michael Mann is a conniving Elmer Gantry, a con artist feeding at the trough of public grant money. The fact that Mann hides out from any honest debate says it all. That sort of post has been replied to ad nauseam for years. Sometimes people don’t feel like answering the trolls. Funny, no one says he got it right….. But if you want to believe he did, that’s up to you. was Wegman’s point, not mine. You “Wrong. It is good science.” is a disagreement with Wegman. That’s 100% right, and they can’t lose. All they need to do is slow CO2 down a little and Presto, AGW averted by the world working together. So what if it re-distributes the World’s wealth until we all have the same income world wide — namely a $1.49 each! [DirkH] That’s why the choice of the method is important and needs to be done with a lot of care. Usually a researcher will want to avoid a false positive. Avoiding a false positive is nit picking for you? That’s a funny statement. Maybe that little horicontal line in front of some numbers like “-1” is also a nit for you, or the little dot in 3.14 just a speck of dirt? I give up Wren, it’s no use trying to talk to you. I hope you never have to use numbers for anything in your life. The very source you quote said Mann got it right. Are McIntyre or Wegman saying they can prove the hockey stick is wrong? Seriously deluded Wren. No one thinks Mann got it right. You’ve badly misinterpreted Wegman. Now, go see Ian Jolliffe, the world’s expert at decentered PCA demolish Tamino’s last defense of Mann. I know you still believe in the Hockey Stick. You do so as a matter of faith, though. Son, you’ve been lied to. Maybe we should ask this, Wren. Why do you think Mann got the right answer? Leave aside for the moment your misinterpretation of Wegman’s statement about ‘Wrong method plus right answer equals bad science’. We’ve shown how you misinterpreted that. Surely that’s not the only reason you believe Mann got the right answer. Is it because you believe subsequent studies have shown a hockey stick? Have you investigated what I claimed in my comment at 19:39:14, that bogus series corrupt the subsequent hockey stick studies, too? So c’mon, put up or shut up. Why do you think Mann got the right answer? I’m trying to decide, Wren, if you are bad or just a useful idiot. C’mon, batter, batter, batter. Swing. I wonder if this is one of the talking points off the iphone app. Don’t use that Wren, it’ll rot your brain. I’m tending to find the big boys and girls of the alarmist camp huddling together at alarmist blogs grousing to each other about the unfairness of it all. There are frequent laments of ‘Exxon’ heard. It’s getting kind of sad. Check out Atmoz where they gather to stick pins in their Revkin effigy. So you base your belief on subsequent studies, which I’ve shown are corrupted, and vague evidence of warming. Heck, we all know it’s warmed. What you haven’t shown is that present warming is unprecedented, which is Mann’s claim. C’mon, you’ve got to do better than that. And you are still sticking to your misinterpretation of Wegman’s remark? You say it yourself quoting Wegman: ‘The fact that the answer may have been correct’. That’s Wegman with a hypothetical. I’m beginning to believe your problem is not an iphone app, but reading comprehension. Wren, from your 21:57:31: “additional large-scale temperature reconstructions”. OK we’ve dispensed with that one. Incidentally, a large scale temperature reconstruction without any of the corrupting series, and with a prominent Medieval Warm Period, is Loehle and McCulloch’s, which uses no tree-ring series at all. Also from your comment “and pronounced changes in a variety of local proxy indicators, such as melting on icecaps and the retreat of glaciers around the world, which in many cases appear to be unprecedented during at least the last 2000 years”. This is the vague warming I talked about in the last comment. The glaciers can’t tell us much about what happened in the last 2000 years, nor can the melting(are they?) icecaps. Some of the glaciers do show evidence that they were shorter within the last 2000 years. Some of the glaciers aren’t even retreating, and for the icecaps, I defy you to say what they’ve been doing for the last 2000 years. We don’t even know what Arctic Ice did last century. So this evidence you have does not substantiate that present warming is unprecedented in the last millenium, which is what the Hockey Stick claims. Have you any other proof of the Hockey Stick? What you’ve shown so far is inadequate. This could give hockey a bad name. Could we just call it the Mann Shtick. I have a bird feeder in my back yard. One of my regular visitors is a wren. Wrens belong on birdfeeders not blogs. Brace yourself, your Grace. Stuff is going to happen. Perhaps I’m being simplistic but isn’t the hockey stick hypothesis subject to independent proof/disproof. If, as snow lines raise and ice cover recedes, the perma-frost exposed will either contain or not contain vegetable matter remains that carbon date to 1000 to 1400 AD or they don’t. Likewise archeological evidence of agricultural activity. If these things are found then any method that suggests that this period was colder than now must be discarded. It might be because its methodology is flawed, a category error was made in selecting the evidence, or because the experimental test was poorly executed, but discarded it would have to be. Same way the hypothesis that radiation frequency from a heat source could increase continously with temperature had to be abandoned during the ultra-violet catastrophy. Since 2009? Seriously? Are you admitting, then, that it was cooling before that? If it’s been warming since 2009, then why are our local temps about 10 degrees below normal since January? IIRC, Spencer explained clearly why he reformulated. At least he documented it, which is more than Mann would do with his short-centered PCA. Studies showed this sort of evidence before Mann fabricated his hockey stick. Studies showed this sort of evidence as Mann fabricated his hockey stick and published it. Studies have shown this sort of evidence after Mann’s fabricated hockey stick came under scrutiny and was debunked. What is particularly infuriating is the fact so much good science by worthy scientists has been smeared, ignored, and vetoed by what amounts to a public relations gimmick by people who do not deserve to be called scientists. I’ll repeat the question I asked earlier. They do not need to prove the hockey stick is wrong. They have already done so. They already have. Mann’s Hokey Stick is completely bogus, and it was debunked by McIntyre, McKitrick and Wegman et. al, despite Mann’s stonewalling requests for his data and methods. Mann’s Hokey Stick eliminates the both the Medieval Warm Period and the Little Ice Age. There is copious evidence for both, and by erasing them to fit his agenda Mann shows a serious lack of scientific integrity. What is wrong is your continued refusal to understand or accept the scientific method. Mann has the obligation to cooperate with requests for the data and methodologies he used to construct his Hokey Stick. But he refuses to cooperate, and the reason is clear to those of us who have been following this issue for many years: if Mann opened the books on his methods, his Hokey Stick chart would be falsified by everyone, not just by the diligence of Steve McIntyre and the others, who showed that a hockey stick shape emerges from Mann’s methods even when red noise – or baseball scores – are the input. You can go ahead and defend Mann all you want, but you might as well be defending a Scientologist preaching astrology. Avoiding a false positive is nit picking for you? That’s a funny statement. Maybe that little horicontal line in front of some numbers like “-1″ is also a nit for you, or the little dot in 3.14 just a speck of dirt? I give up Wren, it’s no use trying to talk to you. I hope you never have to use numbers for anything in your life. But I suspect your reference to “false positive” means you think otherwise. Would you care to elaborate? If you believe Wegman says Mann’s Hockey Stick is wrong, quote him saying it. If you believe McIntyre says Mann’s Hockey Stick is wrong, qoute him saying it. It doesn’t say Mann’s Hockey Stick is wrong. So the Wegman report says small parts of the Hockey Stick are not supported by Mann’s analysis. Over the length of the millennium (1,000 years) the analysis does not support the claim that 1998 was the hottest year or the 1990’s was the hottest decade. Maybe they were, maybe they weren’t. The National Research Council agreed with Wegman on those two points but but found additional evidence supports Mann’s basic conclusion that the late 20th century warmth in the Northern Hemisphere was unprecedented during at least the last 1,000 years. Has anyone used arctic ice coverage (area) as a proxy for Temperature. If so, they maybe have discovered that the great ice melt-off of 2010 has already started: well it is the signal to go on Daylight Savings Time; and we did that Sunday Morning. So now we have about six months to see if the bottom falls out of the Arctic sea ice coverage. Well here’s to all who enjoy this annual catastrophe as it happens right before our eyes courtesy of Anthony’s little gizmo over ther on the right. You’ve got shut-eyed denial, Wren. We took your two points apart last night. Maybe you were asleep. It looks like, after a period of lagging, the arctic ice extent has recovered to about the third highest amount since 2003 and now has started to melt as usual for this time of year. Where are the arrests? Jones, Schneider, Trenberth, Mann, Smith, Hansen, Gore… They should all be in jail. age is found in newly de-glaciated/uncovered earth that doesn’t currently support plant growth then that would disprove the hockey stick hypothesis (Planet Earth hasn’t been as warm as it is now for at least 1000 years)?. Rendering moot the discussion about the mathematical methods used and how well the arithmetic had been done. Mann, M.E., Woodruff, J.D., Donnelly, J.P. and Zhang, Z. 2009. Atlantic hurricanes and climate over the past 1,500 years. Nature 460: 880-883. Has been interpreted by some as essentially disproving the Hockey Stick hypothesis (Allegedlly indicates temperatures in the period 900 – 1300 were substantially higher than now according to some interpretations) Any comment..